Though the Cascades are snow-covered, it is time to start thinking about summer camp. We realize that a Jewish camping experience can be expensive. Luckily for us so did the Sturman Family. They wanted to help the children of Temple Beth Or attend an accredited Jewish sleep-over camp. Therefore, the “Billy and Mary Sturman Campership Fund” was established. We are greatly indebted to Billy and Mary’s children for establishing this fund in honor of their parents. We thank them for their generosity and congratulate them for their vision in supporting our youth. They have recognized the lifelong benefits of Jewish camping and that quality camping experiences can be very costly. 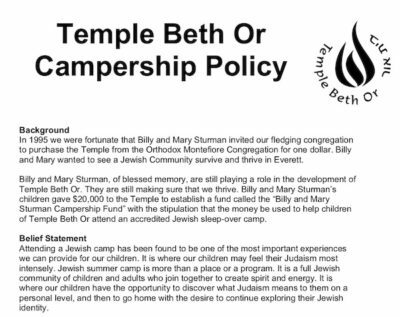 The Temple Beth Or Campership Policy and Campership Application are available for download by clicking on these documents on this page. 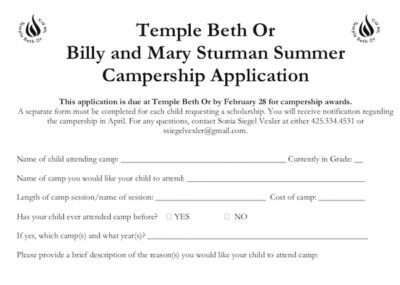 Please print and complete a separate application for each prospective camper. All applications are due in the Temple office by the last day of February. Camperships are based on financial need and preference will be given to children who wish to attend Camp Kalsman. While we at Temple Beth Or have limited resources for camperships ourselves, we are committed to enabling as many families as possible to experience Jewish sleep-over camp. We do know that the sooner you begin looking for financial assistance for your camper(s), the better your chances of finding it. By late spring, most campership funds have been awarded for the year. When applying for camp, it is recommended to attach a letter stating that you have applied for a campership and that the application is dependent on financial assistance. In this case, most camps will refund the deposit fee if you do not receive the funds you need. Camperships are also available at the Jewish Federation of Greater Seattle. Applications are due in early March. For more information, click here. The Jewish Federation also partners with the Foundation for Jewish Camps to offer One Happy Camper incentive grants for first-time campers. Camp Kalsman has limited funds available for families in need of financial assistance. Contact their office at 425-284-4484. We are very excited about being able to help your child have an experience of a lifetime. Questions? Email them to Sonia Siegel Vexler. All questions and applications are kept confidential.